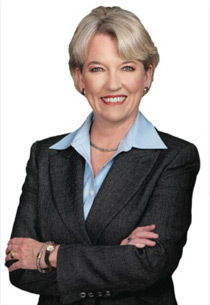 Sharon Allen, Chairman of the Board, Deloitte LLP, Introduces the 2010 Women Worth Watching. When I began my career in 1973, women who were watched for their leadership potential were somewhat rare in corporate America. It’s not that they weren’t “worth” watching — it’s just that there weren’t many of them. Consider my chosen field. Back then, women made up only 5 percent of accounting graduates. However, it wasn’t until I began to look for a job during my senior year of college that I began to understand just how differently I would be perceived in the workplace. The managing partner of one firm was very direct. He told me that he wanted to hire me because his firm was interested in hiring minorities. I didn’t accept that offer. My self-image had been cultivated on an Idaho farm where I walked the fields with my Dad each night after supper to check the crops. Upon my college graduation, I didn’t consider myself a minority but rather a well-trained and hard-working accounting professional — who, by the way, just happened to be a woman. I chose to accept an offer from Touche Ross, a predecessor firm of Deloitte, at its office in Boise, Idaho. With that acceptance came other not so subtle hints that I would certainly be watched. For example, my offer letter pointed out that I needed to work as many hours as the men and travel just as much — and that I should review these requirements with my husband, Rich, to make sure they were okay. Unimaginable in our organization (or any organization for that matter) today. With that as background, I am honored to write this introduction for the Profiles in Diversity Journal’s special issue known as “WomenWorthWatching” — and I’m pleased to report that I was not asked to check with Rich first before sharing my thoughts here with you. So much has happened since I began my professional life as an auditor 37 years ago. The year that I so proudly wore my cap and gown, women accounted for about 40 percent of all college graduates. Today, women are earning close to 60 percent of all college degrees. But that’s not the only demographic trend that is altering the perception of women. In the workplace, women now outnumber men for the first time. In the marketplace, women wield purchasing power in excess of more than $14 trillion. So where do women go from here? To a place where women rightfully belong and in far greater numbers: the C-suite and the board room. The business case for women in leadership has never been stronger. A variety of studies confirm that companies with more women in leadership outperform those companies with fewer (or no) women in leadership – and, across several measures, often by double-digit margins. While there is still much progress to be made, there have been some significant milestones, such as the first woman succeeding another as the CEO of a major corporation when Ursula Burns recently took over from Anne Mulcahy at Xerox. 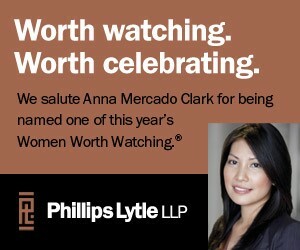 Today’s reality is that there are many women worth watching for their ability to lead and create value. With that comes an exciting new sense of possibility. What was once considered notable – journeys such as the one I made from Boise to the board room, for example — will become increasingly common. In the future, these journeys will be applauded not for the history they make, but for the achievements along the way that make them possible. Fortunately, the guidance and support I described has been an integral part of our culture at Deloitte for some time. Our groundbreaking Initiative for the Retention and Advancement of Women has helped to create an environment conducive to the growth of women as leaders. When our Women’s Initiative began in 1993, I was one of about 100 women who were partners, principals, or directors in an organization with about $2 billion in revenues. Today, Deloitte is the largest of the U.S. professional services organizations with nearly $11 billion in revenues — and, more than 1,000 partners, principals, and directors who are women. Find something you love, and do it. My studies took me to Moscow – Moscow, Idaho, that is. I started out as an education major at the University of Idaho. That’s what a lot of women did in those days. But my roommate studied accounting and she thought I might enjoy it. I took a course, and was hooked for life. For me, accounting allowed me to combine my technical and analytical skills with my desire to work closely with people, and I’ve never looked back. So do what you love. A recent survey found that just 45 percent of Americans — a record low — have job satisfaction. I urge you not to be one of them. Your career is more than a paycheck. Look out for your own career! You can’t assume that the people you work for are aware of all of your “good work.” Early in my career, I remember being passed over for a promotion. I went to my boss, expressed surprise, and shared with him a list of all of the things I had accomplished. He told me that he didn’t know that I had done all of those things! That taught me a valuable lesson. I learned that you need to take personal responsibility for assuring that those around you recognize the contributions you’ve made — and you can find ways to do that without being a braggart. Embrace change and be willing to step outside of your comfort zone. You’ll find it difficult to grow if you stay entrenched within your current boundaries. But while the decision to venture out can be difficult, it can also be exhilarating. 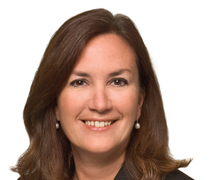 I learned this when in the span of just a few short years I became the first woman to serve on the Deloitte board of directors, moved from my home office in Boise, and eventually became Managing Partner of our Pacific Southwest practice in Los Angeles, with more people reporting to me than lived in my home town. Still, a little bit of time and familiarity can go a long way — and before you know it, each new place will start to feel comfortable. That’s when you know that it’s time to raise the bar again — and look for a new challenge. Have a mentor and be a mentor. Your technical skills can help you advance only so far. There’s judgment to be honed and leadership to be developed. Mentors can be instrumental in helping you fill in the gaps. I know. Mentors who passed their success forward to me have been absolutely critical in shaping my career. What’s important in finding a mentor is that he or she cares about you as a person, is interested in your success, and will help you think in ways that you may not have previously consid- ered. Conversely, you can offer those same attributes to others as well. Your accomplishments and experiences have been made in a rapidly changing professional landscape. Be a mentor and help others benefit from them now and in the future. As you’ll see in the pages of this special issue, the leadership of women at many organizations is generating immense value. 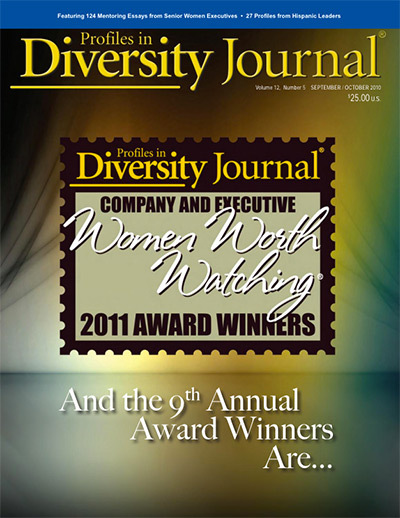 These “WomenWorthWatching” are truly women worth following — in every sense of the word — and I congratulate Profiles in Diversity Journal for bringing you their inspiring stories of leadership.